And hasn’t come a moment too soon. Virtually every stress reaction that my body has displayed in previous years has manifest itself in the last month. I’ll spare you the graphic details. I can not begin to describe how expansive my time feels without too many activities and responsibilities compressed like a marshmallow under a big rock. I feel light and floaty. And relaxed. I took care of some business things to be prepared for my new time/cash flows. I paid off the car loan, I ordered the new refrigerator and I went for a walk in the park at midday. The sun was shining with a cool breeze. While I was strolling there, I found a source for free firewood. Last night, a rock star said, “Hi” to me. Todd Sucherman, a drummer for STYX, was giving a drum clinic in our fair city last night. Youngest son, the percussionist, attended the clinic, which cost $10. I was sitting in the hallway reading my new book Tiny Homes by Shelter Publications, because I am not a drummer, and $10 is $10…no need to waste it. Mr Sucherman had to pass by my chair a couple of times in the course of the evening to get to the room the clinic was in. When I looked up from my book, he said, “Hi.” I said, “Hi” back. And this is as close as I am likely ever to get to a rock star. Unless youngest becomes one. The kids have been on spring break this week, and the youngest stayed at his dad’s house. I took the junior and the sophomore on a tour to visit two colleges in Chicago and two in St. Louis and one in Champaign/Urbana. I didn’t take photos while we were at the schools for fear of embarrassing the kiddos, but here are a few from other parts of the trip. 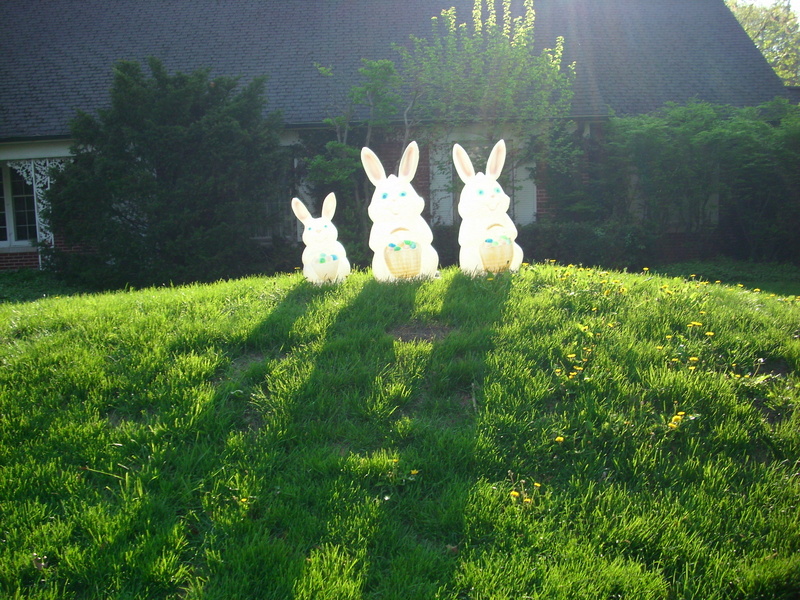 Scary Easter bunnies watching us leave town. 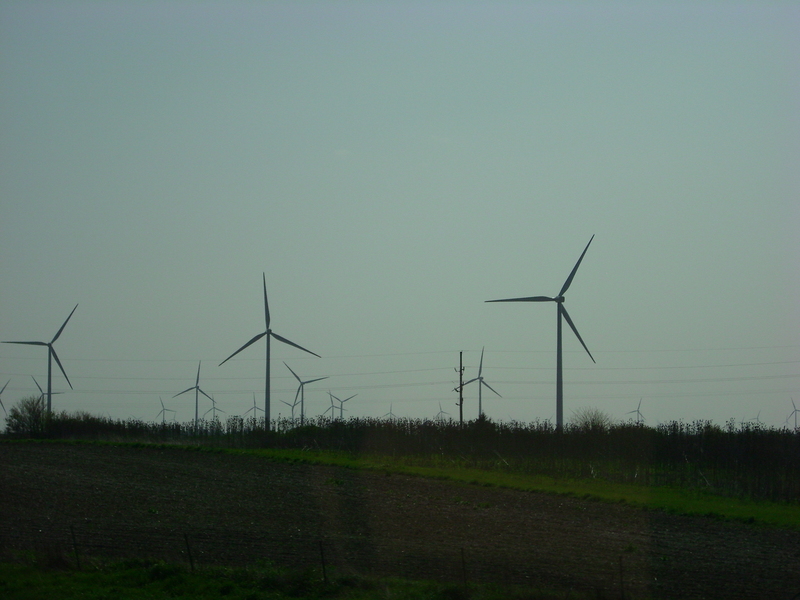 Windmill farm on the drive up to Chicago. These just make me so happy. Yeah, they are not perfect, the noise and vibration can be a problem if you live close. But if one (or three) of them fail catastrophically, at most the world will lose a couple of humans and a few hogs. If a nuclear power plant fails catastrophically, we lose tens to millions of humans, same for domestic and wildlife, and the damage to the ecosystem could be unimaginable. Windmills are a more elegant solution. 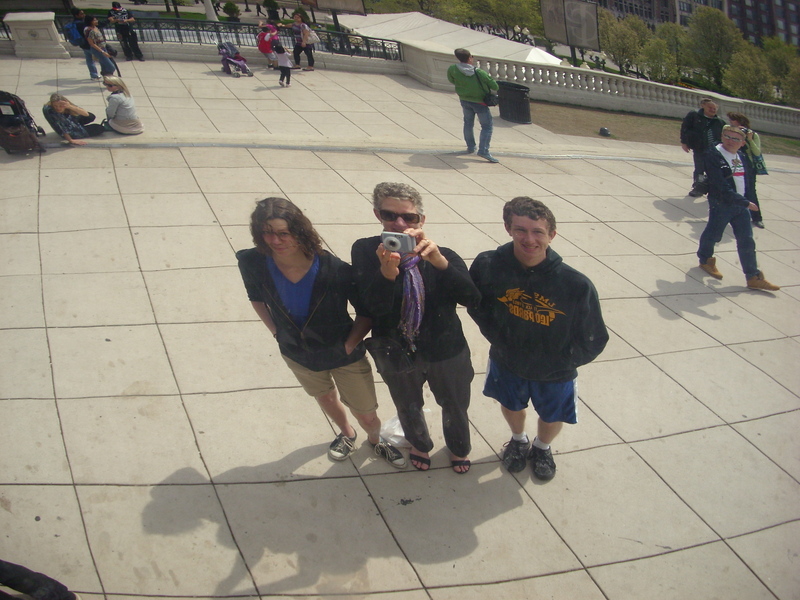 This is me and the kids reflected in “the Bean” at Millenium Park in Chicago. 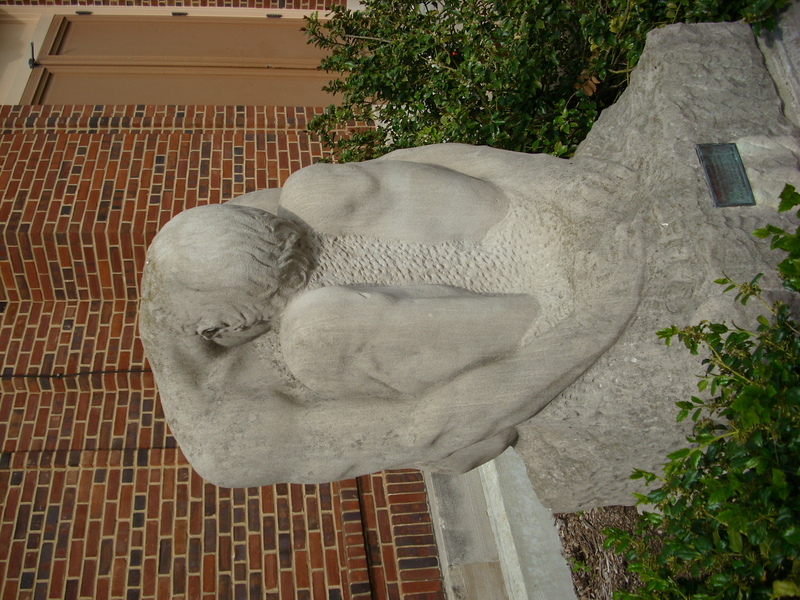 We found this fellow outside the library at University of Illinois. We think he may have failed a test. The trip was fun and informative. We got a chance to check out some colleges that the kids are interested in. We stayed with my brother and his wife in Chicago and my mom in St. Louis, so the trip only cost us for three meals out. It’s official!!! I’m going part-time (four 8-10 hour days/week) May 1st. I have worked these hours before and the difference between working 32-40 hours/week and working 40-55 hours/week is the difference between calm, creative, content and exhausted, irritable, resentful. Come June, you all will not recognize me.